1984 – NBA superstar Kareem Abdul-Jabbar breaks the all-time scoring mark for the National Basketball Association, surpassing the 31,419 mark set by the great Wilt Chamberlain. 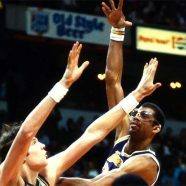 Jabbar broke the record after receiving a pass from team-mate Magic Johnson in the Los Angeles Lakers 129-115 victory over the Utah Jazz in Las Vegas, Nevada. Jabbar ended the game 22 points, five rebounds and three assists. He would end his career as the NBA’s all-time leading scorer and was elected to the Naismith Memorial Basketball Hall of Fame in 1995.